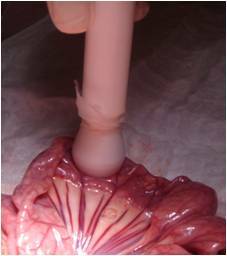 Dehiscence or leakage following bowel anastomoses occurs at a rate of 0-50% with a high associated mortality. Vascular perfusion and tissue oxygenation (SpO2) at the anastomotic site are fundamental determinates of anastomotic viability. 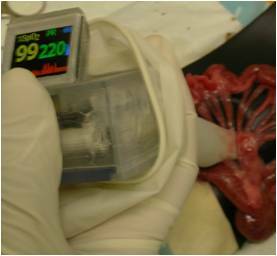 We aimed to construct a wireless pulse oximeter (WiPOX) to monitor intraoperative real-time tissue oxygenation, permitting the identification of unrecognized compromised blood supply at potential anastomotic sites. We have: (a) designed a handheld device capable of real-time monitoring of SpO2 through endoscopic ports with wireless data transmission to standard intraoperative monitors, (b) constructed the WiPOX using materials meeting FDA regulations for intraoperative use and re-use, (c) performed accuracy testing in human volunteers by comparing the WiPOX SpO2 readout to standard pulse oximeters, and (d) tested WiPOX reliability and efficacy in detecting early tissue hypoxia in stomach and intestines following mesenteric and/or gastric artery occlusion in anesthetized rats and pigs. The onboard micro-controller and LED array permitted non-invasive pulse oximetry using modified signal processing algorithms for intraoperative application. The contact pressure-sensing head allowed for consistent, high quality SpO2 waveform readouts even in the presence of body fluids and blood. WiPOX testing in humans demonstrated a relative accuracy within 3% when compared to commercially available pulse oximeters (see Graph). Application of the WiPOX in rats and pigs demonstrated normal tissue SpO2 and pulse rates in healthy small bowel and stomach. Furthermore, within 30 seconds of mesenteric vessel occlusion, the WiPOX detected bowel hypoxia over a wide range of oxygen saturations (see Figures). We have validated a novel wireless pulse oximeter capable of detecting intraoperative tissue hypoxia. A clinical trial in esophageal and gastric anastomotic surgery is planned in order to test the efficacy of the WiPOX in reducing anastomotic complications.